Click on the image above for more information about the Grant recipient for 2019. ​Read about past award winning books. Echoes is the official publication for IODE members across Canada. Published continually since 1902, it is issued twice each year. 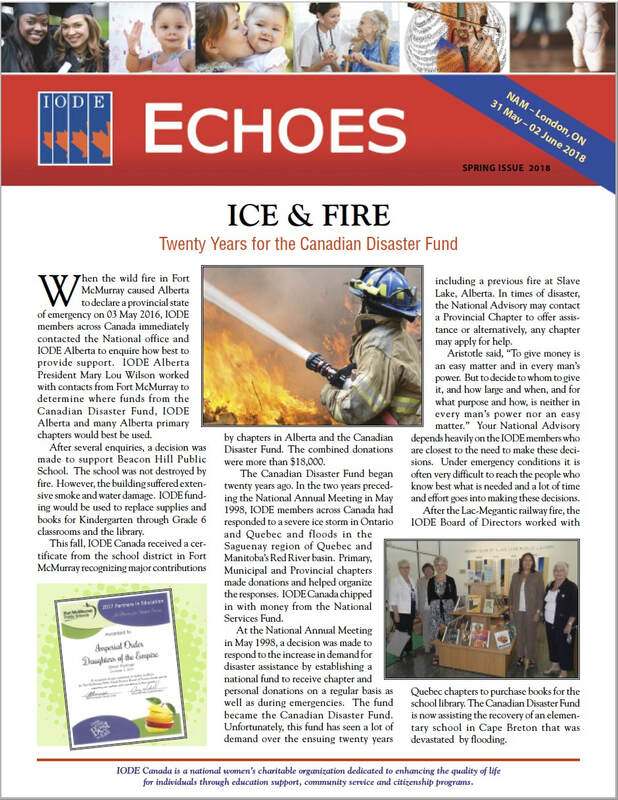 View past issues of Echoes. By joining IODE Canada, you will become part of a growing community of women who play an important role in making a difference in the lives of children, youth, and those in need. Become a Member! 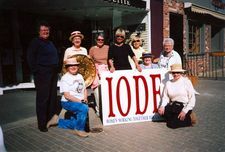 Founded in 1900, IODE Canada is a national women's charitable organization dedicated to enhancing the quality of life for individuals through education support, community service, and citizenship programs. 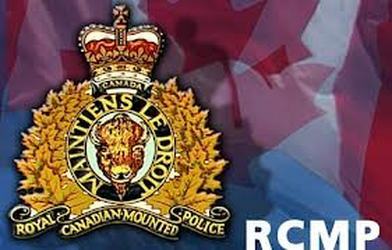 IODE Canada is a national women's charitable organization. Women of all ages, from all walks of life and educational backgrounds, meet in local chapters for fun, friendship and community volunteerism. Members volunteer with and for people, focusing on Children, Education and Community Services. Each IODE chapter has the independence to choose and support projects in their own community. If you have just a few hours to spare monthly, you can make a difference and form lifelong friendships. IODE membership is many things to many people. 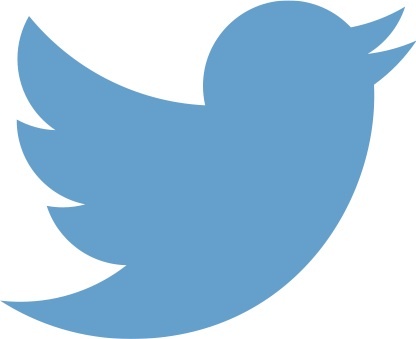 It is this diversification that holds the interest of the members and attracts others to it. What other organization has so much to offer to so many and in such different age groups? The main benefit of belonging to IODE is being part of a like-minded group of women who work together to improve the quality of life for those in need. IODE is proud of its heritage and traditions. 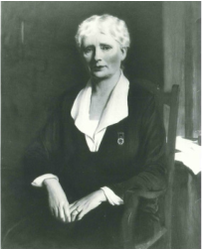 In 1900, Margaret Polson Murray of Montreal encouraged the formation of a federation of women to promote patriotism, loyalty and service to others. The first chapter, Federation of the Daughters of the Empire, was formed in Fredericton, New Brunswick on 05 January 1900. Primary chapters were formed in quick succession across Canada as were junior chapters. In 1901, the Federation was incorporated as Imperial Order Daughters of the Empire and Children of the Junior Branch. IODE was incorporated as a Canadian women's organization by a special act of the Parliament of Canada in 1917. IODE Canada is pleased to announce the first recipients of the Canada’s 150th Anniversary IODE Good Citizenship Award. Visit the special awards page to see the complete list of 202 award recipients to date. In 2017, all Canadians celebrate Canada's 150th anniversary of Confederation. Communities, volunteer organizations, museums, schools and all Canadians have plans to do something special to mark Canada's 150th. IODE Canada chose to celebrate this anniversary of confederation by presenting Canada's 150th Anniversary IODE Good Citizenship Awards to elementary school students who demonstrate qualities of social responsibility and social engagement. The national initiative served to promote the core values of IODE to recognize good citizenship and provide support to local and adopted schools and classrooms. Honour Roll of Awards Presented. 1918 was a momentous year. Although it was not at all clear at the beginning of that year, WW I would finally be concluded. That victory was preceded by unprecedented bloodshed and loss. It brought only an uneasy peace which, unfortunately, did not last. Nevertheless, IODE continued the role it played since the beginning of the conflict – to provide field comforts to our Canadian Forces, to provide weapons and machinery (at the request of the federal government), to care for the refugees of the conflict and to support the military families waiting for the conflict to end and their loved ones to return home safely. Not all wishes were granted. ​One hundred years later, IODE continues to support our soldiers and their families, refugees and those in need. IODE was there during WW II, the Korean Conflict, the many peacekeeping missions our heroes have braved and every other mission in which our forces have been put at risk. Our members preserve monuments, honour cenotaphs, maintain books of remembrance and participate in patriotic events. IODE members are loyal and ever aware that our freedoms require defence. They are also aware of their responsibilities to those in need. They count their blessings and help those whose blessings are few. The Mission of IODE continues to be relevant – and needed. Canada is known as a country of extensive social programs available to all. However, many people fall through the cracks of those programs and IODE is there to help. Our history of assistance is notable. Even today, members find new ways to help, update projects to make them relevant today, turn their attention to those marginalized and ostracised and recognize needs even before they come to the attention of the public. 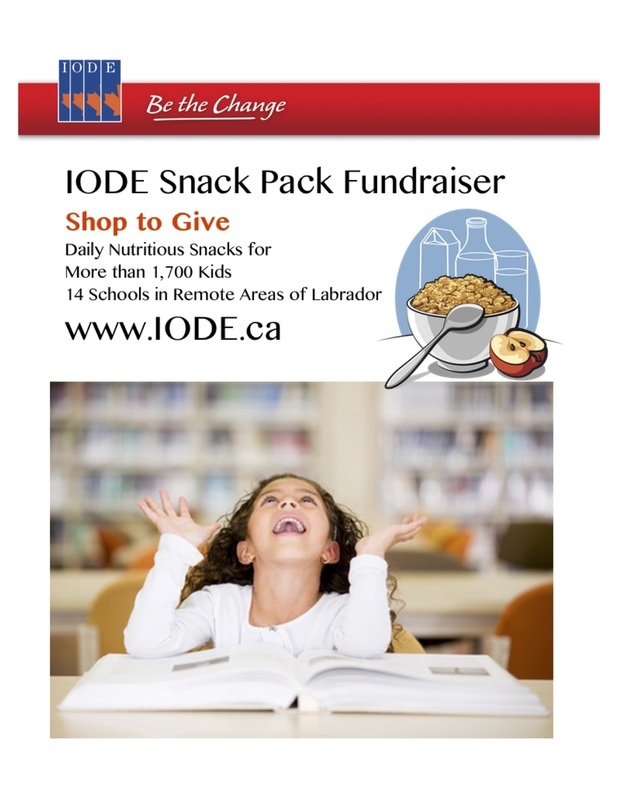 IODE is particularly aware of those in remote areas of Canada that need assistance – Good Grooming Bags, Adopt-A-Class programs, Toys For The North, Services Packing projects, Born To Read, Labrador Bursaries – all across Canada chapters are helping people they will never meet; members who take it on faith that they are being effective. A “thank you” comes randomly and renews that faith. And we carry on. We do what we have always done. For 118 years now, we have heeded the appeal of Margaret Polson Murray back in 1900. We rally to her idea. 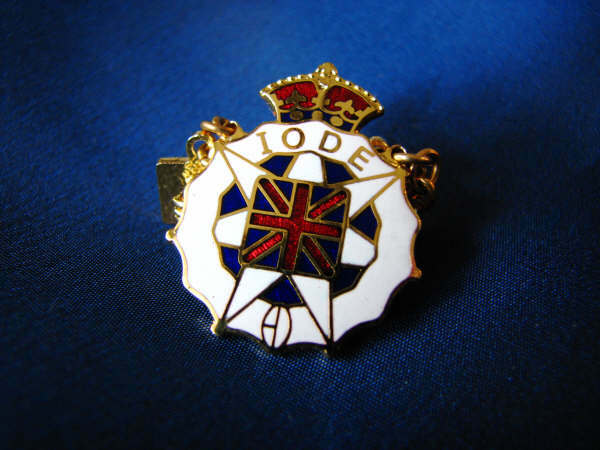 We are IODE and we have a proud legacy – a legacy that members today honour. A legacy of helping those in need: a helping hand; a hand up, a smile, a gift freely given. IODE is as relevant today as it was so long ago. Let us continue that legacy. Let us build on that legacy. Mrs. Murray needed an “army” of women ready to help. Every army needs reinforcements. Today we need to reinforce our IODE army. Reinforce our chapters; reinforce our membership. We have “generals” ready to retire and they need replacements. They need women to take up the challenge of leadership: leadership of our chapters; leadership of our projects. Women are born leaders yet rarely see themselves as such. Clearly, raising a family needs leadership skills. Maintaining a caring relationship with your spouse and children – and their partners – needs negotiating and compromising skills. Determining what to buy this week and what meals to prepare needs budgeting and planning skills. Keeping track of family activities and who needs to be where and when – more planning and logistical skills. Wow – they even let us drive now! Ladies, you’ve got it! Now go out there and recruit. Recruit the ladies who will come to be your new best friends; who want to help those in need (but don’t know how); who are ready to fulfill the Mission of IODE. Make this your personal goal this year. I promise to make it mine. Under the jurisdiction of the National Chapter of Canada IODE are provincial, municipal and primary chapters across Canada. With approximately 3,000 members across Canada in more than 200 chapters, the IODE tradition of serving children, youth and those in need continues. The name IODE was officially adopted in the 1970's. IODE Canada is a federally chartered charitable organization. IODE Canada and our members across Canada undertake an extensive variety of charitable and philanthropic projects every year. These include financial assistance and contributions of time and effort to students, educational institutions, hospitals, the under-privileged and those in need. The National Chapter of Canada IODE initiated War Memorial Doctoral Scholarships in 1918 to commemorate Canadians who sacrificed their lives for peace and freedom. Initially, bursaries were granted to children of men and women who lost their lives or who were permanently disabled while fighting for Canada. Since the first scholarships were awarded in 1921, IODE War Memorial Scholars have made important contributions to Canada and the world in medicine, science, business, politics and academia. As World War I ended, The National Chapter of Canada initiated a living memorial to 60,000 Canadians whose lives were sacrificed. This War Memorial, approved at the 1918 Annual Meeting in Montreal, provided bursaries for university studies in Canada to children of men killed or permanently disabled in the Great War. Immediately, a campaign to raise $500,000 began and by 1920 the first bursaries were awarded. Each province was assigned one award of $250 a year for four years (later increased to $300). Where there was no candidate, the bursary went to another province. In 1929, the War Memorial Fund of the Imperial Order Daughters of the Empire was enacted by special act (Bill 8) of the Legislative Assembly of the Province of Ontario. The War Memorial Committee in each province chose candidates based on their school record, health and character, the war service of their father and the family’s financial circumstances. Both principal and interest of the Fund provided these bursaries until 1937. No awards were offered during the war years and bursaries ended in 1965. Scholarships based on academic excellence continued to be offered. The War Memorial Post Graduate Scholarships began in 1921 for one college graduate from each province to spend one year at a British University. Among the first to hold this scholarship for 1922-1923 at King’s College, University of London, was Bertha M. Lawrence from Alberta. The value of a scholarship was $1,400 until 1930 when it was raised to $1,600. Post Graduate Scholarship used only the Fund’s income. No awards were offered during the war years and when peace was finally declared, in 1946, the members of IODE decided to establish a Second War Memorial to honour the memory of forty some thousand men and women who lost their lives for Canada and in defense of freedom. The Post Graduate Scholarships from the two War Memorials Funds were originally offered in specific fields of study. Today, there is no such restriction. Applicants must be Canadian citizens and in at least the second year of their doctoral program. Scholarships valued at $15,000 are now awarded to students attending Canadian or Commonwealth universities. A committee in the province of the candidate’s first degree makes selections and forwards nominations to the National Chapter where the final decisions are made. The National Selection Committee is comprised of five IODE members and three professors from different universities. The National Chapter of Canada IODE War Memorial Scholars have made important contributions to Canada and the world in medicine, science, business, politics and academia. 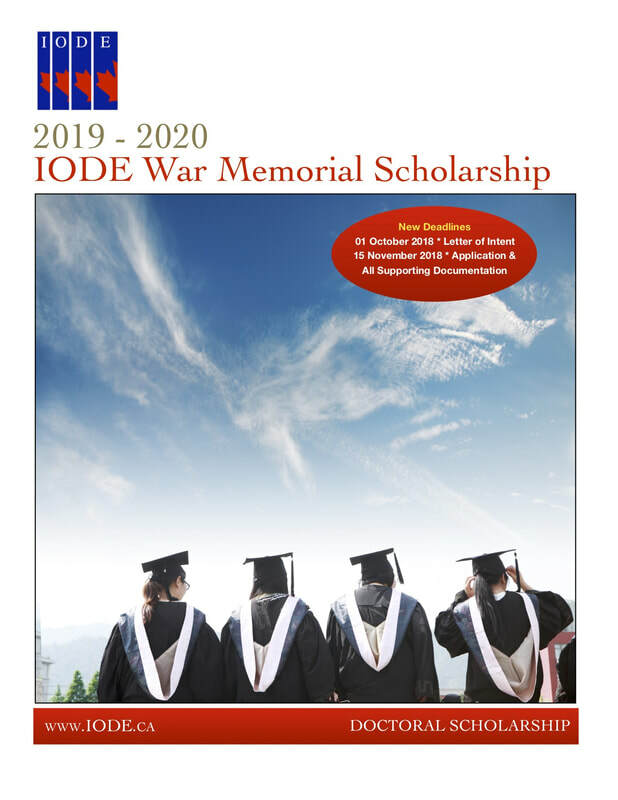 Applications are now being accepted for the 2019-2020 IODE War Memorial Scholarship. Complete information and application forms are available at www.IODE.ca.